Dolly Lybarger, 78, of Liberty Center, Ohio passed away October 25, 2018 at her home. She was born May 22, 1940 in Toledo, Ohio to Harvey and Margaret (Rier) Zeh. On August 13, 1959 she married Doug Lybarger at the Neapolis Church of Christ. 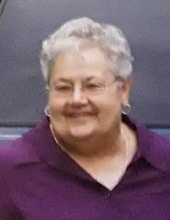 Dolly worked many years for the Anthony Wayne Schools as a Bus Driver, Lunch Lady and Playground monitor until she retired in 2000. Dolly was also active with the Neapolis Church of Christ where she served in the Sunday School, Bible Summer Camp and assisted with the funeral luncheons. She enjoyed camping and spending her winters in Alabama. Dolly loved animals and was a foster parent for many dogs. Dolly is survived by her husband of 59 years Doug, her sons Dave (Deb) of Delta, Doug of Liberty Center, Dennis (Tammy) of Swanton, and Dean of Delta, her 8 grandchildren, 9 great grandchildren, and her brother Bob Zeh of Maumee. She was preceded in death by her Granddaughter Tiffany Lybarger, her brothers Jim and Bill Zeh, and her sisters in law Sharon and Sally Zeh. Friends and family are invited to a visitation on Monday October, 29 2018 from 4 to 8 pm at the Peinert Dunn Funeral Home, 6603 Providence St. Whitehouse, Ohio. Funeral services will be Tuesday at 11 am at the Neapolis Church of Christ, 8221 Main St. Neapolis, Ohio. Pastor Dan Horner will officiate. Burial will follow at the Mt. Pleasant Cemetery. To leave a donation in Dolly’s memory please consider the Ohio Living Home Health and Hospice, 1730 S. Reynolds Rd. Toledo, Ohio 43614. To send flowers or a remembrance gift to the family of Dolly Lybarger, please visit our Tribute Store. "Email Address" would like to share the life celebration of Dolly Lybarger. Click on the "link" to go to share a favorite memory or leave a condolence message for the family.